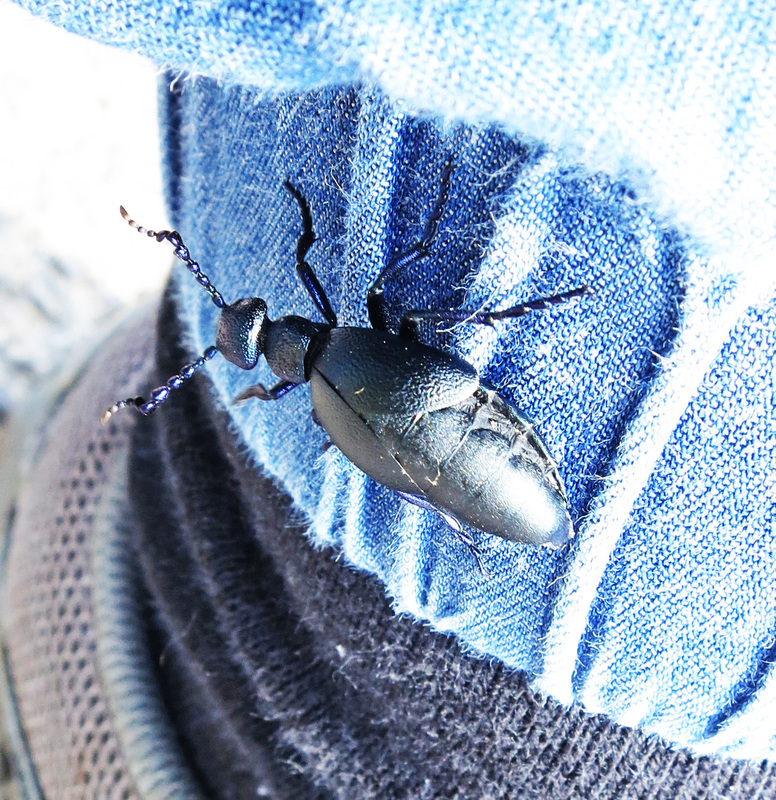 Black Oil Beetle (Meloe proscarabaeus) exploring my leg. I was in a micro-village where there are primroses, sheep, a red telephone-box and a Church with what I took at the time to be a Saxon tower but which isn't. This is where The Grand Old Duke of York took his ten-thousand men to the top of a hill and marched them down again. What on earth were they doing? Keeping fit? Trying to get their bearings by spotting the sea in the distance? As you can tell - this isn't a very academic blog. I expect I could easily find out but haven't lifted an internet finger in search of an answer. I wasn't there to study military history or research nursery rhymes, I was planning a stuck-foot post. It wasn't going well though. The light was all wrong. There was an interesting mound of moss but it was throwing off white glints so detail didn't show. There were some flowering dead nettles - which are pretty but dark and they weren't coming out well in photos either. There were some flat white stones embedded in the bank like bricks and . . . and . . . what was that . . . that black thing which moved? are the spiracles - through which it breathes. This is the thing with a stuck foot post; first you realise there's always much more in any place than you might expect; and sometimes you discover (or re-discover because it can be a perpetual surprise) that when you're looking for one thing it may take a few moments before you notice others you didn't expect - and having once noticed them, they may turn out to be there in numbers and suddenly they are un-un-noticable. 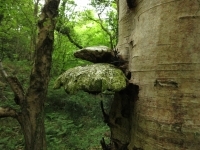 So - if hadn't rooted myself to that particular spot I might never have seen . . . seen . 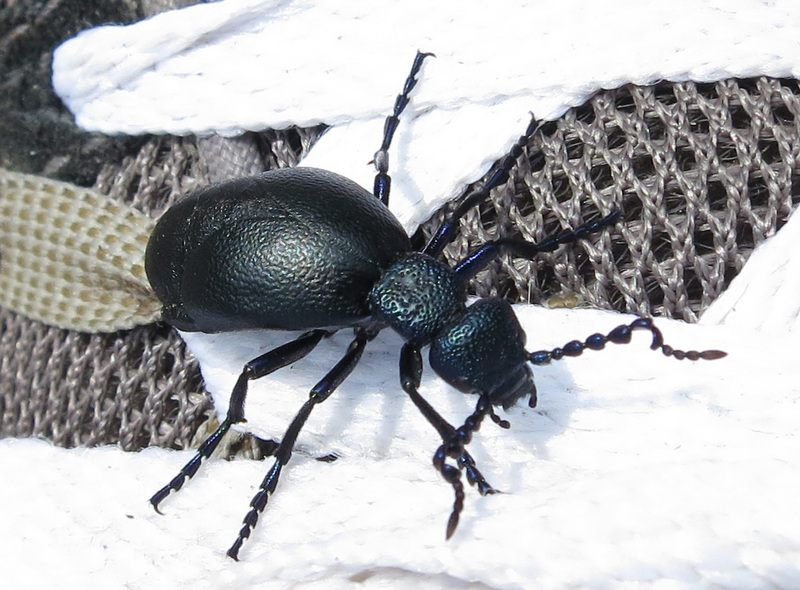 . . masses of Black Oil Beetles (Meloe proscrabaeus). That was the end of my stuck-foot post. Abandoning any attempt at standing still, I hurried along the bank. There were masses of the!. Now I'd tuned my eyes to them - they were everywhere! falling off blades of grass and stones (they kept falling off things) pottering into the road, mating, laying eggs (I think that's what they were doing) and generally living their beetley lives while not a car passed and I ran up and down being excited because, although they are not rare, I'd never seen them before - at least, not in these numbers. Laying eggs? Or waiting for the right moment? I may still know nothing about The Grand Old Duke of York - but did find out a little about the beetles. Having mated, each female digs burrows (maybe two or three) and lays eggs in them - up to a 1,000! When they hatch (generally a year later) they climb flowers and hang out with the pollen in wait for solitary, ground-nesting bees. 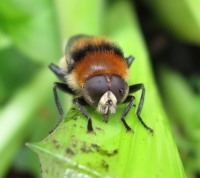 ('Solitary bee' indicating the kind of bee which lives alone rather than one which is out on a mission by itself from its hive.) When one comes along (hopefully the right kind!) they climb onto its back and hitch a secret lift into the bee's burrow where turn into larva and eat the bee's eggs, pollen and nectar supplies. They pupate, turn into adult beetles, spend the winter in the bee's burrow and emerge in the spring to begin the cycle again - which is what they were doing when I came across them scurrying around in my stuck-foot post . . . and all along the bank below the hedgerow. blue its intense beauty is impossible to freeze. 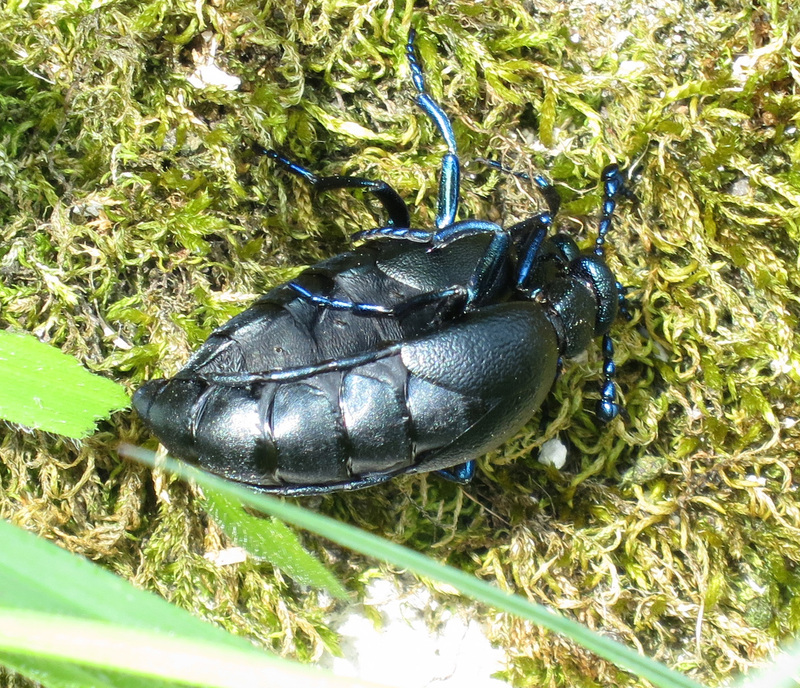 What To Do If You See an Oil Beetle. A moth for a bonus! On the ceiling in my house. 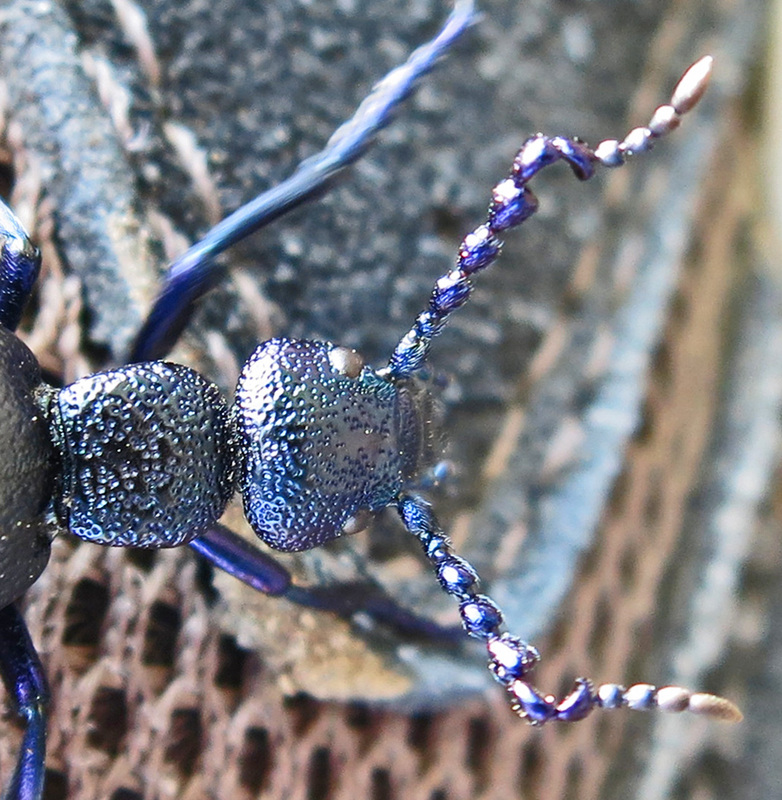 If you are in Scotland - click here - you may come across the rare Short-necked Oil Beetle. There is so much going on that we humans don't notice, unless we stop and look and wait. Hello Janet. I was lucky that particular beetle decided to leave the grass and walk on my foot - it moved into better light; so in that I was lucky. As for the ones in the grass - little detail because every time I got them in focus they fell off their blade or stone. At earlier stages in their lives they have a good grip so they can fly on bees - by this age they seem to have lost it! Hello Mike. That's where a camera comes in. If I try to identify something by memory - I learn how little I remember. Having a camera always about my person helps! Sometimes insects can be told apart only by quite small details that one doesn't necessarily know about in advance - like how its head meets its neck or its neck its body. Great photos, Lucy. 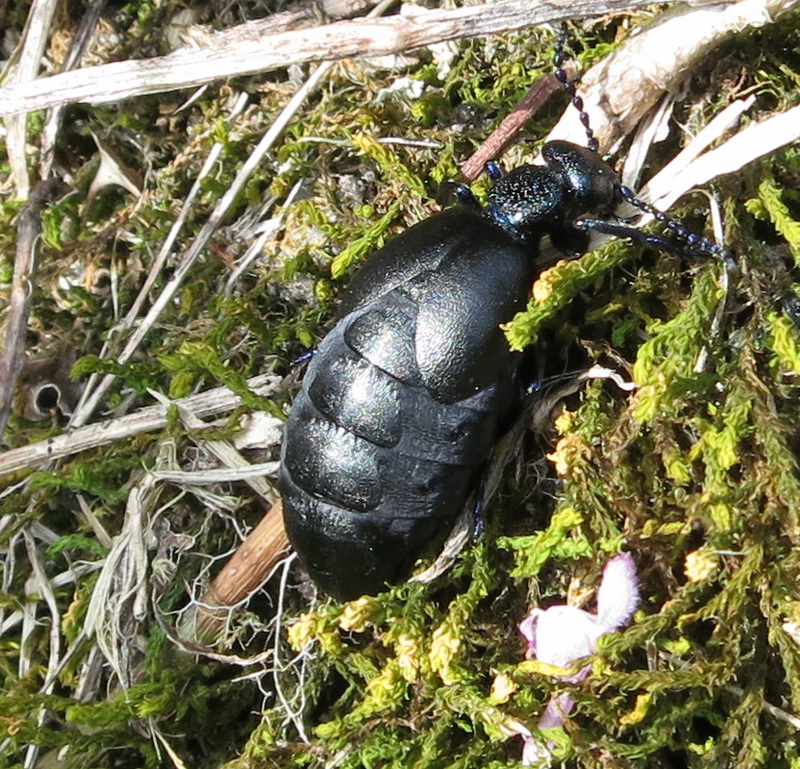 It's been a couple of years since I saw a black oil beetle, I'll have to keep my eye out this year. Such a complicated life those beetles have in many ways. All that waiting. Love the idea of a stuck foot post - and really enjoyed this one. 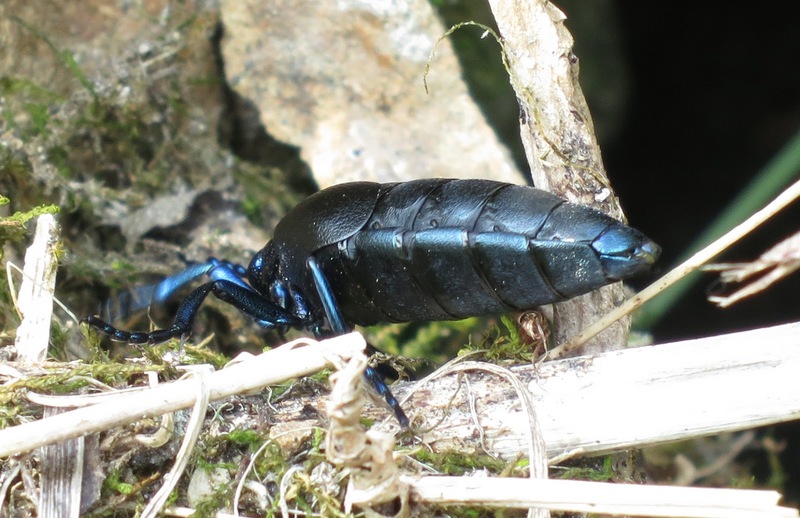 Older sources say 3 species because brevicollis and mediterraneus were thought to be extinct in Britain, until their rediscovery a couple of years ago by Bob Heckford and John Walters respectively. There's actually 8 species native to Britain, 3 of which are thought to be extinct here, 2 found at 1 or 2 sites, 1 rare, 2 scarce. Nice find! I must try a Stuck Foot post some time! Stuck Foot post -- another great idea from Lucy, thanks! Oh, that is the most wonderful blog post! I see now where you get your powers of observation from (standing still!) - I must learn the lesson. A ver interesting post Lucy, I like to learn new things and these beetles are superb. 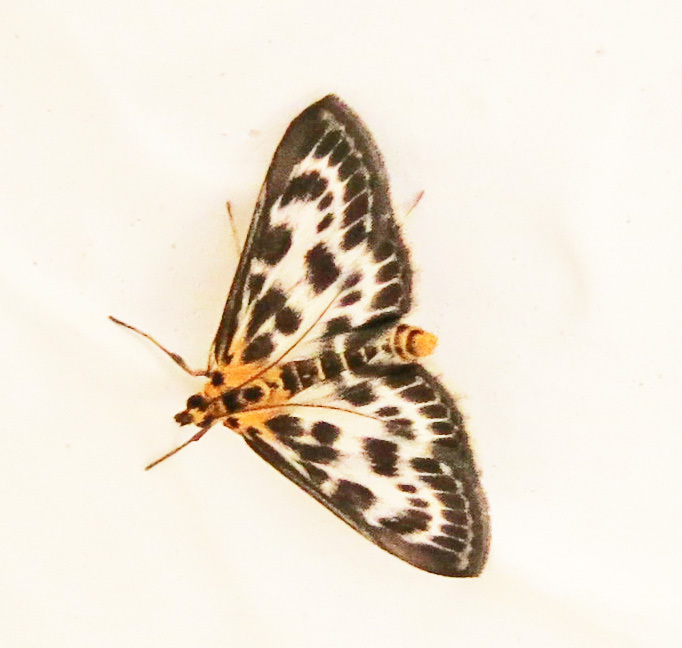 Every year I get a Magpie moth in my house, just the one.